As I researched for this article ahead of Sunday's Connacht football final in Hyde Park, I went back to the headlines that previewed the 2017 final featuring the same two teams. The general consensus across most forums the days leading up to that game was Galway would win, with The Irish Times going with a headline 'Galway set to overcome Roscommon in Connacht final'. The odds for the game which was played in Pearse Stadium on July 9 last year were the exact same as Sunday’s - with Galway at 4/9 and Roscommon available at 5/2. We all know Roscommon blew those headlines and Galway away with a resounding 2-15 to 0-12 win that shattered the pundit’s predictions and left Galway supporters rocked by the lacklustre nature of their team’s performance. Roscommon were good on the day, but Galway did not produce anything of note and never really took the fight to the visitors. Since that defeat the Galway mantra under Kevin Walsh has been even more pronounced, with the focus always being on producing a “consistent performance”. And that renewed focus has resulted in a productive year for the squad so far. Reaching a division one league final when they went toe to hand with the all-conquering Dubs for 60 minutes, and two solid wins over Mayo and Sligo, sees them into Sunday’s final with Roscommon at Hyde Park (4pm ) in a good space. The team has a good few newcomers too this year who have added much to the party, with Seán Andy O’ Ceallaigh, Ciarán Duggan, Seán Kelly and Peter Cooke impressing on different occasions, while free-taker Barry McHugh has been impeccable from placed balls. Ian Burke did not feature in last year’s Connacht championship either, and only came into the starting 15 for the round four A qualifier game against Donegal. His availability and current form is a big plus too. Galway seem more settled and efficient in their defensive structures this year and Tyrone’s Paddy Tally - a new recruit to the management team this sesaon - has to take some credit for some of the improvements in that area. The template was already in situ, but a few modifications and tweaks have enhanced the model. 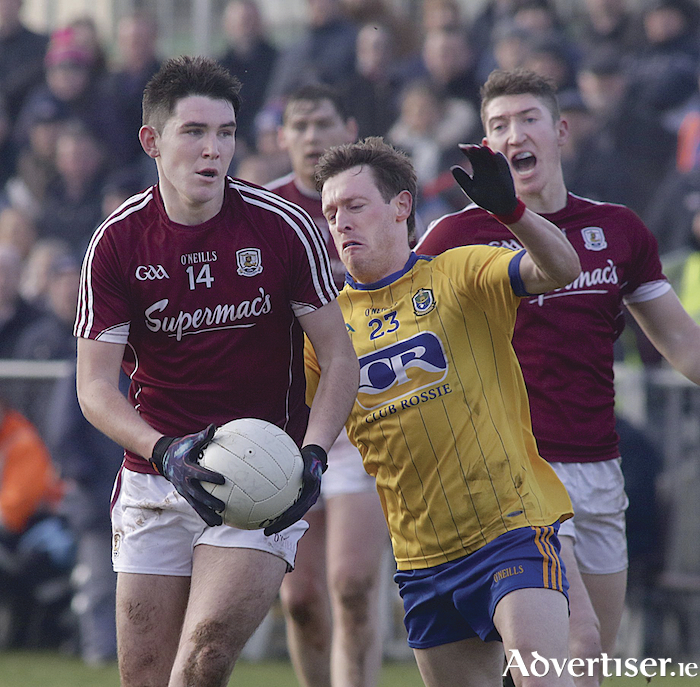 Sunday poses a really big challenge for Galway, though, as Roscommon have some very creative and talented players up front with Diarmuid and Ciaráin Murtagh, Enda Smith, who did a lot of damage at midfield last year, and team captain Conor Devaney all very good players. Following last year’s nine point defeat the Galway players who were involved that day should lack for nothing in the motivation for revenge. The Galway supporters making the journey down to Hyde Park will be expecting a fierce and intense display from any Galway player who sees action. Regardless of whatever system a team is using, players have to go out and produce a big individual performance. Being “up for the game” mentally and physically is the foundation rock of such a display. Galway will need their experienced leaders down the middle, such as team captain Damien Comer, Gareth Bradshaw, Tom Flynn, Shane Walsh and Paul Conroy to show the way by winning possession and using it well, in a disciplined and productive way. Top class discipline from the Galway players is imperative, a red or even a black card can be extremely costly for any team’s hopes of success. Mayo paid a big price this year for the Diarmuid O’Connor red card in the first round against Galway, and last year the Donal Vaughan and Keith Higgins red cards in their championship run were big moments too. We saw last Saturday the price to be paid for an early red card in the U20 clash with Roscommon, and every Galway player has to take personal responsibility not to do anything rash or stupid that would cost his friends and teammates a chance of a provincial medal. Fire in your heart and ice in your veins is what is requiredfor big sporting occasions. In this parish we are going for a Galway win this weekend based on the fact that I think the Galway forwards can do a job on the Roscommon defence. Mayo took them for 4-19 in the All-Ireland quarter-final replay last year and Cavan while beaten, got in too easily for scores in this year’s Division Two decider. If Flynn, Duggan, Conroy and Cooke around the middle can get enough possession to Comer, Shane Walsh, Ian Burke and Eamonn Brannigan, with Seán Kelly and Johnny Heaney in support roles, then I do not believe the Roscommon defence will be able to hold them. Galway’s kick-out strategy is crucial too, and how Ruairí Lavelle finds his half-backs and midfielders is critical to Galway winning. If he finds his men, assuming they show properly for him, and Galway get ball in hand and move it fast, they can win.